For almost 30 years, this iconic public service announcement was running on American television right before the late night newscast to remind parents to look after their kids. Our lives as marketers revolve around customers. Ultimately, everything we do is geared towards making them happier, increasing their engagement with our brand, and enhancing their loyalty. As a result, we all want to design the perfect customer experience. This experience is going to become our primary source of competitive advantage in the future and research findings seem to support this notion. Gartner shows that 89% of companies are going to compete mainly on customer experience, and a Walker study predicts that by 2020, customer experience will surpass product and price and become a key brand differentiator. However, we can't achieve this goal without knowing our customers well - like really freaking well. And it's much more than just being aware of our customers' names, companies, and which campaign they've come from. To really get to know our audience, we need to go one level deeper and ask ourselves about actions our customers take or don't take, while engaging with us. You need to understand their true journey with you. Do my customers watch any promotional videos before signing up? Do they read my blog? Check out my case studies? How do they prefer to get in touch with my company? Contact forms? Email? Chat? What's the first action my customers do right after signing up? Do they add a credit card? Download our mobile app? Invite friends? If you don't have data that answers these or similar customer journey questions, you're most likely missing out on some super valuable behavioral insights. Even if you do, however, it's still not enough to see the full picture. If you think of customer journeys in terms of simple sales/marketing funnels, you're doing it wrong. It’s critical to keep in mind that customer journeys include every single touch point that a customer has with your brand, and, as you might expect, these touch points are not limited just to what occurs in the sales and marketing funnels. Let’s understand the difference between funnels and customer journeys. When it comes to funnels, you should keep in mind that any funnel we create exists in our head only. Customer journeys, however, are all about the actual experiences users have with your brand, and it’s your users who get to choose how they want to engage with it. Sales/Marketing Funnels = actions that we assume our users should do. Customer Journeys = actions that our users actually do. If you focus just on sales/marketing funnels, you’re going to miss out on the important pieces of your customer journey and not capture the full picture. Funnels can be flawed and differ dramatically from customer journeys. The biggest fallacy here is to assume that all your users need to go through these four steps to convert, while this might not be necessarily the case. Sure, some of your users might actually complete all steps in this funnel before they convert, however, others might convert by going through step A or step C only, or skip the steps altogether! Sales/marketing funnels tend to oversimplify user experience and don’t take into consideration different scenarios of how customers can engage with your brand. This is not the only problem though. Even for users who've completed all the predefined steps in your funnel, their experiences with your brand and customer journeys are not going to look exactly the same. User John might perform three more actions in-between steps B and C, while user Jen performs 15 more actions, and user Jamie does 28 actions (she decided to read all your blog posts) in-between exactly the same two steps. All these actions are integral pieces of their customer journeys, and if you overlook them, focusing just on the funnel, you’re definitely not going to get the full picture. Also, for the sake of argument, let’s say that John goes through the entire funnel on his desktop, while Jen does it on her phone, and Jamie switches between both. What I want to emphasize is that unlike sales/marketing funnels, which assume the exactly same experience for all users, every single customer journey is distinct and unique. As mentioned earlier, it's the user who gets to choose how they want to interact with your brand and usually there's no effective way for you to control that. Given that customer journeys are unique in their nature, it's pretty much impossible to capture and analyze every single journey, but don't get scared - that's not your ultimate goal. What we're looking for here is to find certain patterns and trends that our successful customers follow (aka customers who've hit a certain goal that we pre-set for them). Alternatively, we want to detect weak spots and bottlenecks in our customer journeys so that we can take proactive action and improve on our customer experience. Designing a customer journey should revolve around asking the right questions about what your customers do. When you start mapping your first customer journey, ask yourself: “Which steps are required for my user to convert into a paying customer?” This would allow you to detect bottlenecks in your customer journey that prevent users from converting. Let’s take me as an example. I'm a marketer at Woopra, which is a B2B SaaS company. Based on the numbers, my website conversions look quite good, however, we're losing almost 70% of new signups when it comes to installing the tracking code, and this is our bottleneck. Right away, this high-level data is telling me that we need to improve on our onboarding experience and better educate new signups on how to set up the code snippet. My first step was to build the end-to-end customer journey, starting with the first engagement a user had with our website and going all the way till the point of their conversion. This report gave me a high-level overview of how customers engage with Woopra, but there’s a lot more to learn about what’s happening in-between the steps of my end-to end journey. Basically, what you want to do is to get a magnifying glass and explore different parts of your customer journey in more detail to better understand what exactly drives customer behavior. In my case, I can split my end-to-end journey into two major parts - pre-signup and post-signup journeys, and explore each part in more detail. What’s the first page my users visit after landing on woopra.com? Is it the pricing page? The analytics? The journeys page? Which page has the highest conversion rate? Are users who’ve visited my blog more likely to add sign up? What’s the first report my users run right after signing up for Woopra? Do our docs bring any value and educate users on how to add the code? Are users who’ve shared Woopra with their teams more likely to become paying customers? How many shared accounts do our paying customers have on average? To make things simple, let's say I want to explore my pre-signup journey in more detail. Now my goal is to check if our blog has any impact on my conversions. 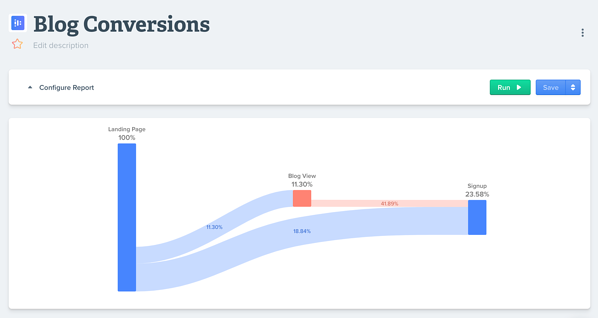 As you can see, users who visited Woopra's blog are 2x likely to convert than those who didn't. This is definitely a great news for me! I can't emphasize enough how important it is to segment your users based on certain behavioral traits they share, and check if these segments behave any differently when it comes to the same customer journey. Think of the different ways you can slice and dice your audience. Mobile vs Desktop? North America vs Europe? Organic vs paid traffic? Even though most of my signups come from the mobile industry, they are 2X less likely to add the tracking code and convert into paying customers than eCommerce and SaaS users. This is actually a really valuable insight because now I can focus on investigating why this is happening. Is it the lack of documentation? Problems with our mobile snippet? Lack of support for different mobile platforms? A lot of questions to answer but this is a great starting point! Don't limit yourself to the website data only. Add every possible customer data source to the mix so you can have the most detailed view of what your customer journey looks like. Let's get straight to the point -- there's simply too much disparate customer data out there and this creates a lot of mess. There is website data, product data, ad data, email data, customer support data, chat data, and the list goes on and on. All these data live in different services and data warehouses, don’t talk to each other, and there's no way for you to tie all these data together to an individual user. As a result, you end up with siloed and segmented customer data that contradict each other and prevent you from actually understanding what the heck your customers are doing. Data is pretty meaningless in isolation. To get the real value out of it, you want to connect all these data points together and give it some context. When you do this with your behavioral data specifically, you start getting a glimpse of what your customer journey might look like. Bad data pushes you in the wrong direction, so you end up spending your marketing budget on the campaigns that don't have the highest ROI. As an example, let's say you run a brand new email promotional campaign using Mailchimp and you use Stripe for payments. There's no easy way for you to tell how much in new incremental revenue your campaign is bringing just because your Stripe customer data doesn't talk to the Mailchimp data. First thing that you want to do is to create a comprehensive list of all places where your customer data lives now. Also, make sure to add your website, product and mobile app data (if applicable) to the list. Now when you have the list of all your customer data sources ready, it's time to bring your engineering team on board. Discuss with them how your company currently handles customer data on their back-end, what are the pieces of customer data you are currently missing, and how much time they can allocate to consolidating this data. There are several different options you have when it comes to consolidating your customer data. Your company might build an internal solution for streamlining customer data if engineering resources are not an issue. Just keep in mind that it'll require a lot of engineering oversight as well as constant maintenance to make sure that everything runs smoothly and you're not missing out on any customer data. Alternatively, you can use tools like Segment or mParticle that move your customer data between different tools and warehouses. Keep in mind that integrating Segment might require some engineering effort and oversight as well. Another option is to take a look at a tool like Woopra. Woopra has dozens of integrations with the most popular SaaS platforms that instantly allow you to stream customer actions and properties to their profiles. What's really game changing about these integrations is that they can be installed in just one click so no technical resources are needed. Using HubSpot for marketing emails? Install the HubSpot integration from the marketplace and a user profile is going to be populated with all their email activities. 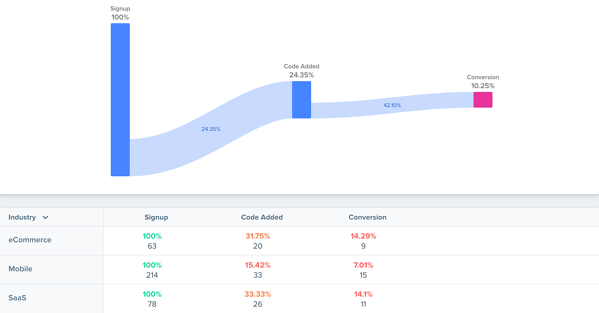 Augment the profile with chat data from Intercom, support data from Zendesk, payment data from Stripe, and now all your customer data is where it's supposed to be - your customer profile! Centralizing customer data and having it all available in one hub is critical and potentially the most important step to unlocking the full power of customer journeys and getting the most meaningful insights out of them. Note: In case all these data concepts sound way too confusing to you, don't worry - you're not alone. 75% of marketers agree that they lack relevant skills and knowledge to make business decisions based on essential data insights and The CMO report by Conversant has found that only 16% of marketers feel 'very confident' about being capable to identify a user across multiple devices and touch points. Here at Woopra, we believe that everyone should have access to customer data regardless of their background and technical level. Our mission is to empower every marketer to become a data scientist on their own, even if they've never touched SQL in their lives. Even if your experience with data is close to zero, you can still run sophisticated journey reports and query millions of data points to gain the most comprehensive insights into your customer journeys. Any time we talk about customer journeys, it's always great to change perspective and see your company the way your customers do. Early in their journey, a customer will most likely engage with some of your marketing assets (ads, blog posts, website etc). Some time later, your sales team might get in touch with the customer, and if everything goes well, they'll convert into a paying client. As time goes by, this customer might interact with your account management team, product team, customer success team, or any other customer-facing team in your company. As you can see, throughout their journeys, customers get to interact with different teams across your company. 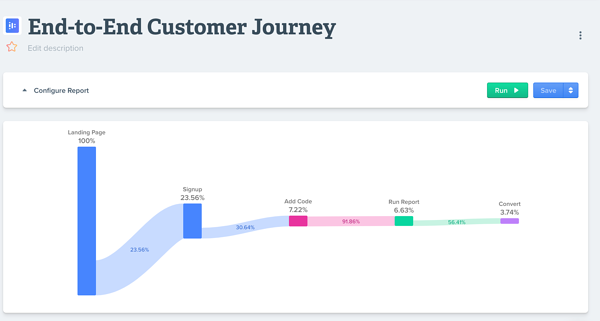 Even though each team might have their own KPIs and collect their own customer data when it comes to these individuals, there's no such thing as a marketing customer journey, sales customer journey, or product customer journey. From a customer perspective, it's still exactly the same journey where they organically progress from one stage to another in their customer lifecycle. To them, there's only one holistic end-to-end customer journey that encompasses different parts of your organization, and to get to the holy grail of customer journeys, you, as a marketer, have to take responsibility for all of it. When you're responsible for the end-to-end customer journey, you understand better how your marketing campaigns perform. Let's say I'm running a new marketing campaign. I have all the campaign data on how many people have signed up for Woopra and how many have converted into paying customers. Is this enough data to gauge how my campaign's performing? Woopra is a SaaS platform so customer stickiness is the ultimate measure of success for me. To make any meaningful conclusions, I need to go beyond conversion data and add customer retention data to the mix. With that in mind, If my retention data's telling me that most of my new customers cancel their accounts within a short period of time, despite great conversion ratesI know the real picture is not that rosy. My conversion numbers are kind of deceptive. The point is that marketing data alone doesn't tell you the full story. When you put it into context and combine it with product data, as an example, you can actually get to the core of how your marketing activities pay off. When you're overseeing the end-to-end customer journey, you can also identify your best customers and see what they did. Knowing your best customers allows you to identify the magical “aha moment”, or a set of actions that results in new customer activation and the highest engagement with your product. As an example, Facebook found out that their aha moment is adding 7 friends within 10 days after signing up. How do you get started? Your company is most likely using Net Promotional Score or some other survey tool to measure customer satisfaction. Go ahead and find your happiest customers or promoters as you would typically, but then reverse their customer journey and see what it looked like for them from the very beginning. Which industry do they come from? How did they find out about your product? What was their first engagement with your brand? Did they download your mobile app? Which product features are they using the most? What we're doing here is, once again, looking for patterns. Whenever we find a pattern that our best customers share in common, we can better replicate it in our future initiatives to serve new customers. We all hate churn. Churn kills companies. Churn is expensive. It costs 7x more to acquire new customers than to retain old ones. Churn marks the end of a customer journey. When you look beyond the marketing journey to the whole journey, you can see when customers churn and, most importantly, why. Is it your copy that misleads customers? Did they experience any bugs/technical issues? Were they unhappy with the customer support provided? Were they not properly onboarded? If you're responsible for the end-to-end journey, you can proactively work with other teams across your company to resolve any issues affecting a customer experience before churn gets bad. Understanding end-to-end customer journeys benefits not just the marketers but your organization as a whole, as it completes the customer experience puzzle and brings all teams onto the same page when it comes to customer data. The good news is that the majority of marketers is finally aware of this, and a survey conducted by the Economist shows that 86% of CMOs and senior marketing executives believe they will own the end-to-end customer experience by 2020. Keep in mind that customer journeys are not set in stone and you will never find “the perfect customer journey”. They are dynamic in their nature. As your business evolves, they are going to evolve and get more sophisticated with it. 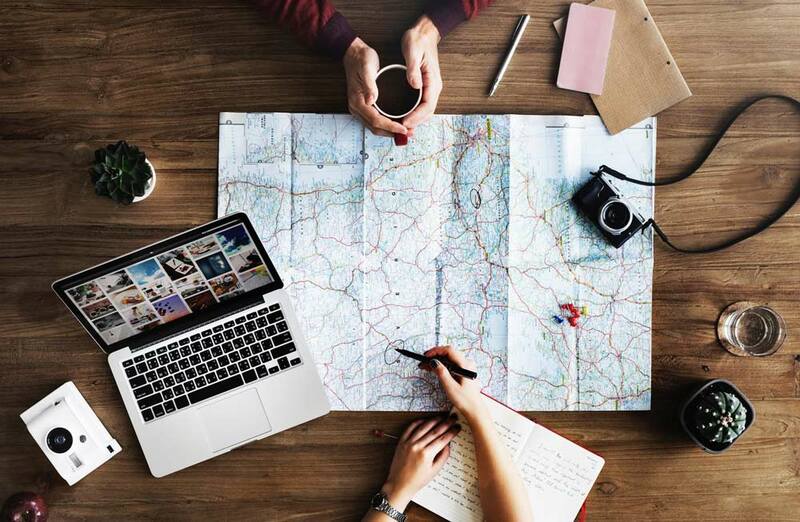 In fact, The State of Customer Journeys report by Kitewheel estimates that journey interactions they track surpassed 3 billion in 2017 - up from 400 million touch points they had when they started in 2014! So always be ready to tweak and revise your customer journeys, add more data sources, and think of different ways how your customers can engage with your brand. And remember, when they “it is all about the journey and not the destination,” we, marketers, couldn't agree more. Happy adventures!